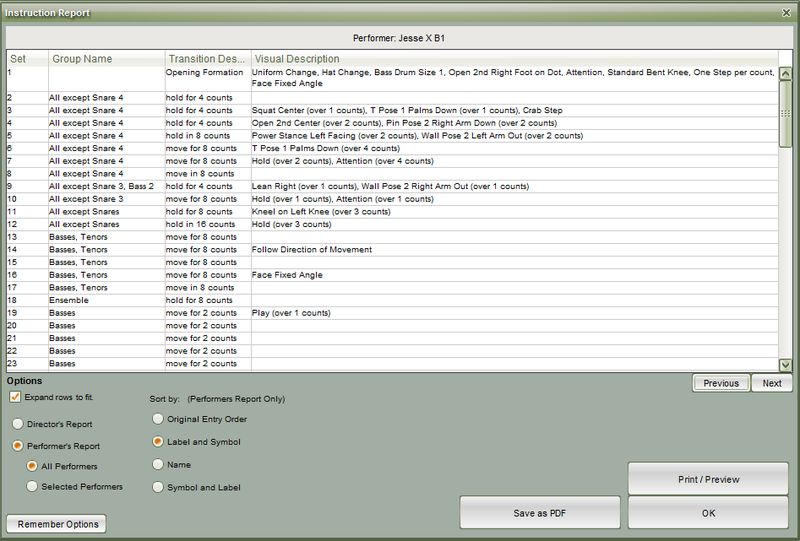 The Performer’s Report prints a list of specific instructions (such as movement, visual, equipment, and uniform changes) each individual performer in the drill. This report is intended to be specific instructions for each performer in the ensemble. A more generalized report for the full ensemble can be viewed by printing a Director Report. Both Director’s and Performer’s reports are generated from the Command Editor data. To edit group names or transition descriptions, you would need to open the Command Editor. Click on the Performer’s Report button to view the Performer Report data. The Performer’s ID (Name, Symbol, Label from the Cast List) for the performer you’re currently viewing is displayed at the top of the window. Each Set (or page tab) in the drill is displayed, along with a Group Name and a brief Transition Description for the group. *No titles in the Group Name column? See the Command Editor page for an explanation as to why that happens, and how to easily fix it. Visual Description information is generated from the Visuals Editor. Expand rows to fit will expand any row with too much data to print in a single line. Previous and Next buttons cycle through the reports of each performer in the drill. The option to print either all performer reports or only reports for selected performers is found under the Performer Report button. When Selected Performers is chosen, reports will only print for performers that have been selected on the design grid prior to opening the Print Instruction option. You can sort the Performer Reports by Original Entry Order, Label and Symbol, Name, or by Symbol and Label. From this window, you can either create a PDF of the Director Report by selecting Save as PDF, or print a hard copy by selecting Print/Preview.